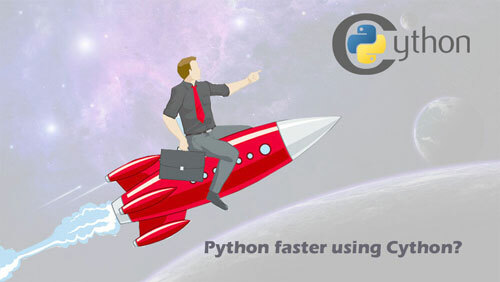 ﻿ How to build Python apps rocket boost using Cython? Why do we need Cython? Cython basically acts as an intermediary between Python and C/C++. Why do we need to make python faster, as it is considered as one of the advanced languages? We also prefer using Python due to its simplicity in writing code but still, it is lagging in computations. This is the core heart reason for using Cython version in Python. Cython allows us to add typing i.e., to add the data type to variable and reference class attributes that will then generate a C Source file of the Cython file and as well a c extension for Python. Let’s refer to the below diagram in order to get an idea of how Cython works. We will see the above flow diagram in working with the help of the example below. To keep this blog simple, I will take a simple example to show the computation difference between Python and Cython. In this code example will calculate the sum of even no.s. In this code, we need to use for loop and in the upcoming session, we will see how Cython makes run for loop efficiently. Suppose the name of the file is test_py.py. Here we are writing simple Python code only. def - They are regular python function, used in Python only. cdef - They are only Cython functions, for this, there is no C translation of Python. cpdef - It will create a C function and a wrapper for Python. We'll be mostly using cpdef. 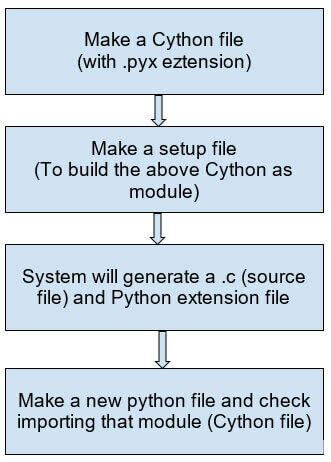 There are some other methods to make this Cython executable but the standard one is to build a Python extension. As this methods avoid dynamic compile on every run. For this, we need to add a setup.py file and have to build every time whenever there are certain changes in Cython code. After building this setup.py file, you are ready to import the above code (Cython) as a module and free to use its functions. After creating a setup.py file we need to build it. We will build it using the command line. Go to the folder where all these files are created and open cmd. Run this command to build setup.py file in order to generate a c source and Python extension file for the Cython code. Hope, all clear so far. Now, you are ready to import it as a module. Now will create a new python file (checking_module.py) and will see the difference between computation time of Python and Cython. Every time you will run this code will give different output. In the code above, we are calculating the time taken by same Cython code and Python Code. For that, we are using time it module of Python and with 1000 repetitions as for single run, it will give very less value and will not be able to determine the difference. You can check by changing the parameter values as well such as value passed in sum_even_no function and number of repetitions. In this blog, we have seen how to make Python faster using Cython. As Cython is the C version of Python development services. With the help of code examples, also see that Cython is really fast. In our code example, it was 18 times faster. In many cases, we really need to boost up the speed, such as some Machine Learning Libraries numpy, pandas are also using an efficient version of Python which makes use of Cython itself. Hope you get a better understanding of what Cython is and how to use it.